It’s time for some more camping adventures! Only this time, we are stepping out of the mud and into the tub. 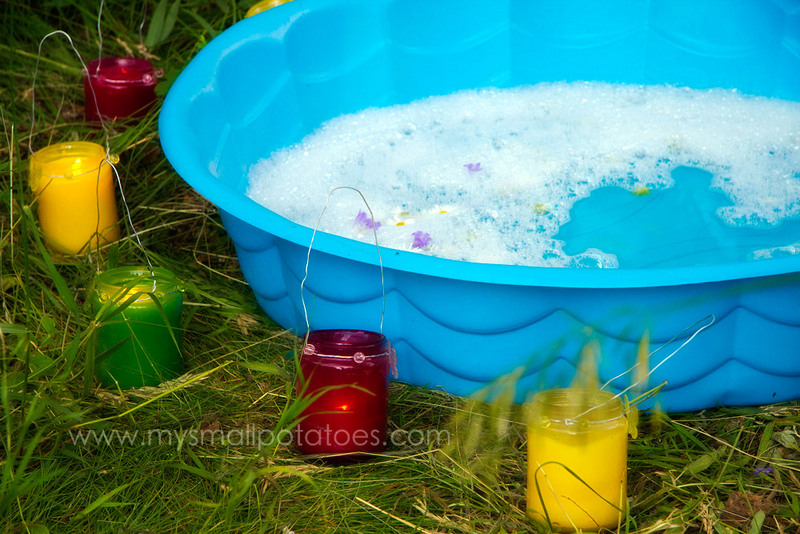 Do you remember those $10 puppy pools we used for our toddler paint party? Well, I brought them camping with us because you never know when you might need a plastic pool, right? After all the mud play, the little pools were a blessing. 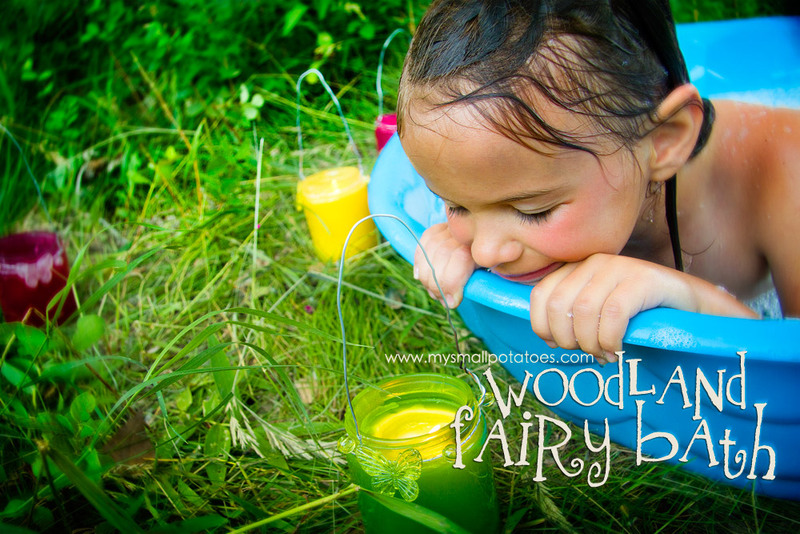 I lit our pretty citronella candles to keep the mosquitoes at bay… We also gathered flower blossoms from the woods behind our campsite to add to the bubbly water… Now we had a bath fit for a woodland fairy! 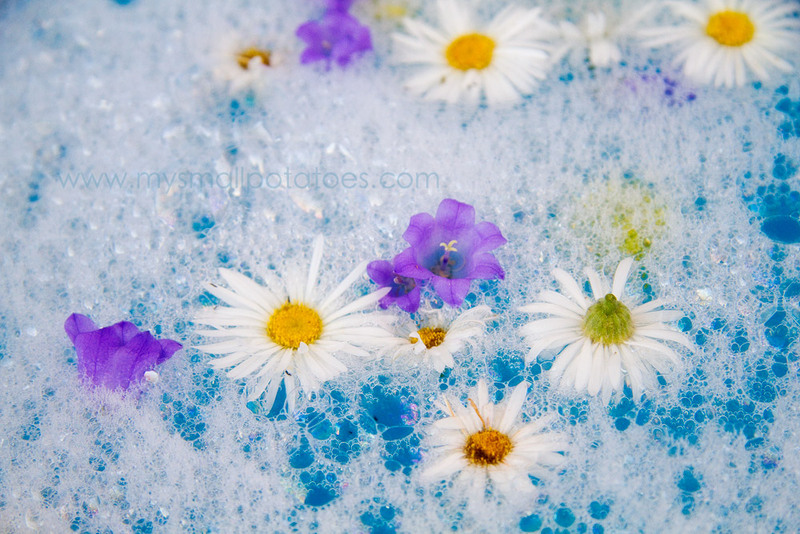 Coco loved her flowery bath and I can only imagine the thoughts that went through her head as she bathed in the last moments of daylight, tucked away in her own part of the woods… Such peace, we grown-ups rarely experience! 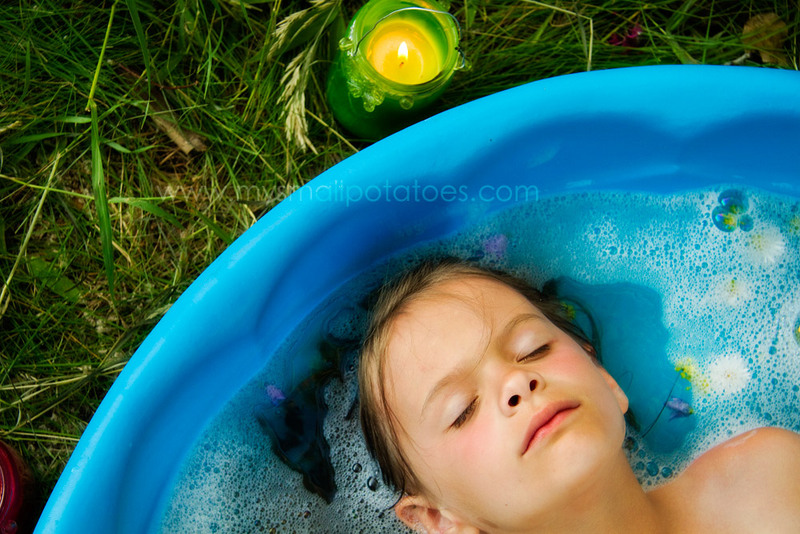 She lingered in her bath long after the water had grown chilly…but this little fairy didn’t seem to mind at all. 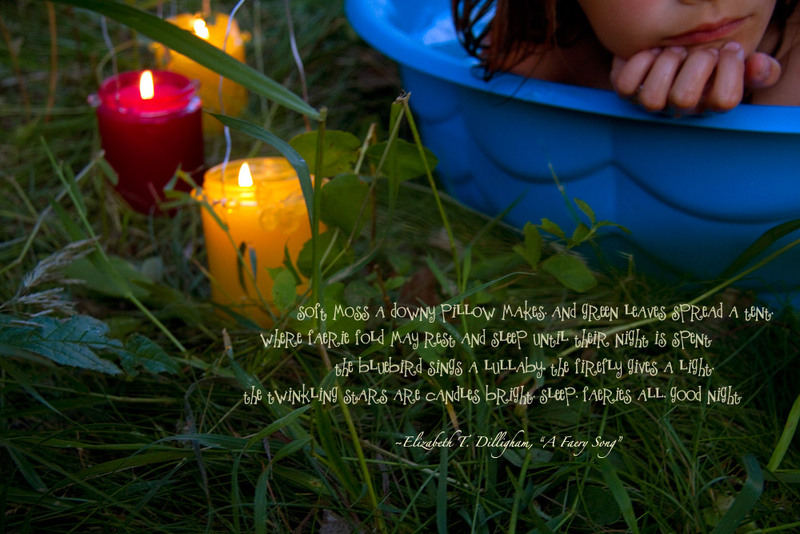 She watched the candlelight flicker as the sun began to sink, mesmerized by its hypnotizing dance… All too soon, it was dark, and time for little fairies to wrap in a towel and get their pj’s on… Goodnight, wee fairy girl! Sleep tight! it looks so beautiful and peaceful! You are right, we, grown-ups, need the peace as well! I hope your girl have beautiful dreams. Good night! What a dreamy end to a magical day in the forest, Arlee. Brilliant to take a pool along with you to the campsite! Thanks, Jackie!! My big kids were like, “awww mum…where are we gonna fit this thing?? !” Lol!! It fit in the RV bathroom tub just nicely!! How did you get it to bubble, did you use a whisk? Did you boil water on the campstove for the hot? 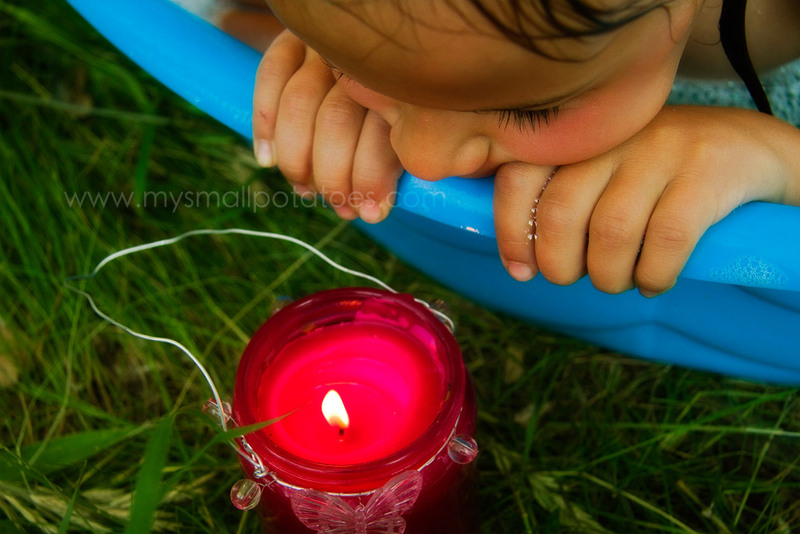 I’d love to do this for my littles, we are going camping next week! Cristi, I just put the soap in the bottom of the pool first and when I poured the water in, it got sudsy. Then I mixed it with my hand real quick. and yes, I boiled the water on the campstove and added cold buckets of water to make it just right. ENJOY!!! What a great idea. I am going to replicate this for my daughter in the backyard. Pics are so cute! How dreamy and magical… I love the colours in these photos! You go, girl!!!! I love that attitude!! oh… I would have loved to be one of your kids.